A cruise along Loboc River with buffet lunch and live performances onboard the boat is a feature in almost every Bohol one-day tour itinerary. The river cruise will typically start at the jetty by the Loay Bridge (which is about a 20 minutes drive from Tagbilaran City) – our tour itinerary took us to the Corella Tarsier Sanctuary and Chocolate Hills before driving back to Locboc for the lunch cruise. If you are not travelling as part of of a tour group for the Loboc River Cruise, expect to pay about 450 Philippine Pesos for the cruise – P300 (for food) + P150 (for cruise). These floating restaurants are made of two banka-hulls (long catamaran boats), over which a large wooden platform is placed. There are a number of dining tables placed around this platform and a long buffet table in the centre. On the floating restaurant boat that we were on, the buffet spread was quite limited, comprising mainly fruits, local Filipino delicacies, a fish dish, 2 meat dishes and rice. These were not served on a tray warmer so the food were quite cold. The boats are usually reserved for tour groups so it is not uncommon for guests who arrived early to wait on the boat for quite some time before the boat departs from the jetty for the cruise – however they can help themselves to the food first and that explains why the food were cold (as it had been out in the open for quite some time). We were one of the last few groups to board the floating restaurant and there were a lot less food in the buffet line than expected. 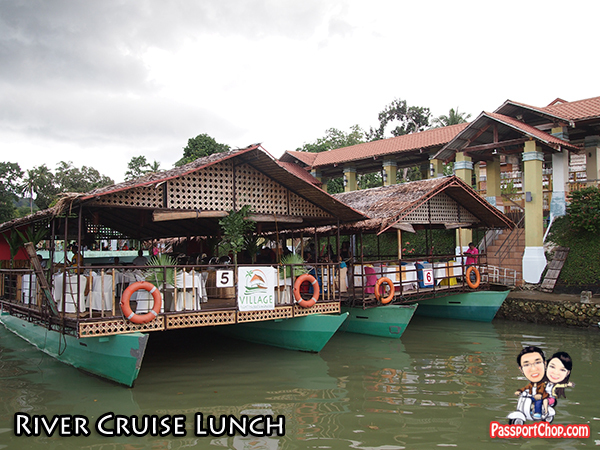 When the floating restaurant started its cruise down Loboc River, there were refills of the buffet line – from another small boat sent to resupply the buffet line as the boat continues to cruise down the river. In terms of hygiene, don’t expect too much – there were lots of houseflies flying around but the floating restaurant did made an effort to post some of their staff by the food armed with sticks (with strips of paper attached to it) to chase away the flies from the food. Cruising along the river, you get to see how the locals lived along the river – with their own fishing boats (bankas or canoes). There were some parts where you get to see children climbing onto a tree over the Loboc river and playing in the water or doing their own “cannonballs” into the river. 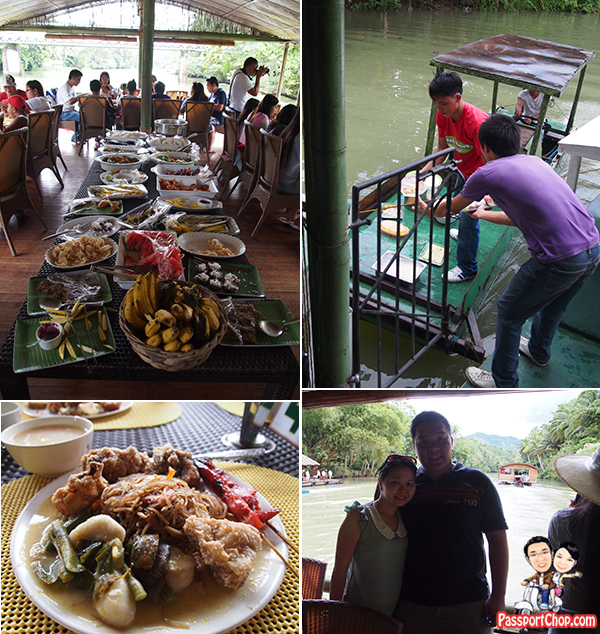 We were also entertained with a live band performing on the floating restaurant – the singing was not bad. Midway through the cruise, the floating restaurant stopped by a platform just off the riverbank. Here, a group of children will do a series of song and dance performances for guests onboard the floating restaurant. 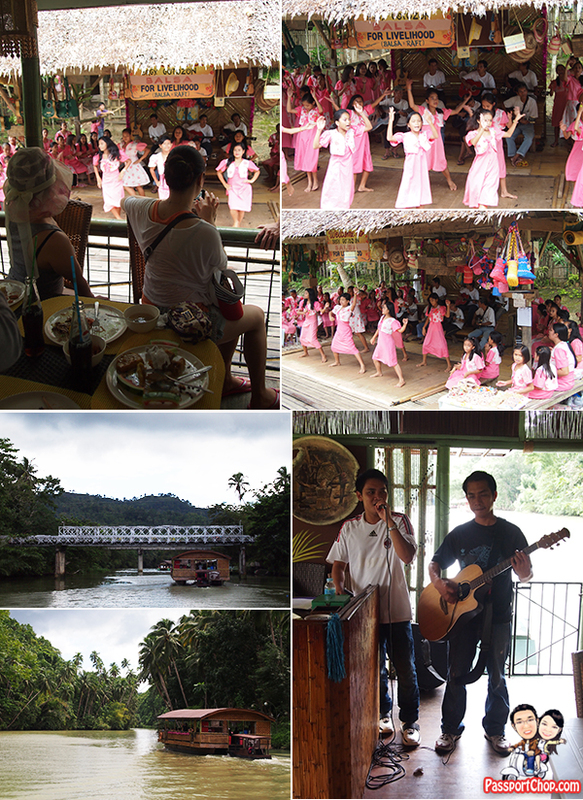 Check out the video below for a preview of what these children performed during our floating restaurant’s brief stop. The entire cruise takes about an hour and the floating restaurants turns around near Busay waterfall – this is a mini-waterfall and cruise downstream back to the jetty where the cruise journey will end.